Your house is bulging at the seams. Whether you are moving to a new place, clearing out the spare bedroom for your in-laws’ next visit or simply need somewhere to keep all of that “extra” stuff, Zippy Shell is ready to help. Zippy Shell Incorporated is a national provider of portable storage and moving solutions. We offer a complete suite of services ranging from self-pack storage all the way to full-service moving. Headquartered in Washington D.C., Zippy Shell currently has 56 independently operated, corporately operated or jointly operated facilities in 106 markets, including Columbus, Ohio. 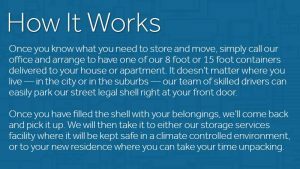 Whether you need moving services or storage service options, Zippy Shell can help. Once you know what you need to store and move, simply call our office and arrange to have one of our 8 or 15 foot containers delivered to your house or apartment. It doesn’t matter if you live in the city or in the suburbs—our team of skilled drivers can easily park our street legal shell right at your front door. Once you have filled the shell with your belongings, we’ll come back and pick it up. We will then take it to either our storage services facility where it will be kept safe in a climate controlled environment, or to your new residence where you can take your time unpacking. Easy and stress free, Zippy Shell offers you the freedom to clean out your home or apartment at your own pace, pack everything the way you want it and store it for as long as you like without worry. Try Us Now And Get A Discount! Get 15 percent Off Your Next Move! Right now you can get 15 percent off the best two written quotes that you get from any other moving and storage company in the area. This is available for 1-3 day moves and can save you hundreds in relocation costs. Zippy Shell prides itself in offering its customers the absolute best storage solutions at the cheapest prices in the Greater Columbus area. Whether you are a homeowner trying to get rid of the clutter; a student moving into your first place, or an apartment dweller who needs a place to store some of their stuff, Zippy Shell is ready to help. Check out our website to see what options will work best for you. And don’t forget to ask about our military discounts and seasonal specials!